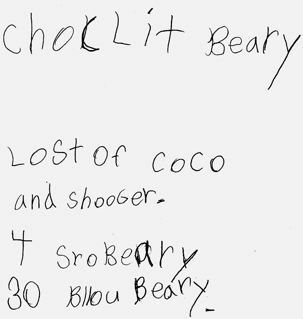 My nephew Keegan, a recent graduate of the first grade, randomly left this scrap of culinary eloquence on the kithen counter one night recently: it's a recipe for a chocolate-berry smoothie. My sister sent it to me, and I wanted to share it with all of you. Note how he combines precise measurement of the blueberries with the "eyeballing it" technique for the cocoa and "shooger" - look out, Food Network! That is obscenely precious. He could be your sidekick! Oh my god. This is amazing!!! How cute, love the spelling of "shooger"
oh goodness. Too cute. I have one of those my sister wrote (a recipe for pancakes with this mus sugar) which I keep framed in my kitchen!